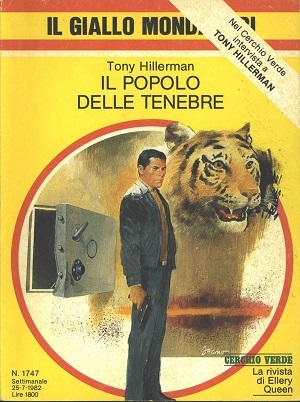 The Italian edition of Tony Hillerman's People of Darkness (1980), the fourth novel in his Navajo mystery series, and the first to introduce the character of Sergeant Jim Chee. This edition was published in 1980 by Arnolodo Mondadori Editore in Milan Italy. Tony Hillerman's original text was translated from English to Italian by Walter Molon. The series, Il Giallo Mondadori, was published weekly, and has a two column format. This edition, number 1747, was printed for readership for the week of July 25, 1982, and contains an interview with Tony Hillerman, originally published in the US mystery magazine The Ellery Queen. An excerpt from a letter from Hillerman to his translator, Walter Molon, is included in the interview. Although the editors of Il Giallo Mondadori attribute the letter to an exchange between Hillerman and Molon regarding People of Darkness, the letter and the drawing are actually an explanation for an earlier novel, Dance Hall of the Dead, which Molon also translated. Format: Paperback, 19 x 14, cm.